Pop up gazebo is the perfect way to create your own domain no matter where you are. Bring along one of these innovative gazebos to parties, events, the beach, tailgating and more to protect yourself and others from the elements. Pop-up varieties have a distinct advantage over rigid ones because they can be set up on the fly. Piecing together a bundle of poles and fabric just isn’t ideal, which is why these systems are designed to literally “pop up” at your command. These gazebos are designed with portability and flexibility in mind, and are able to be fit in most car trunks. 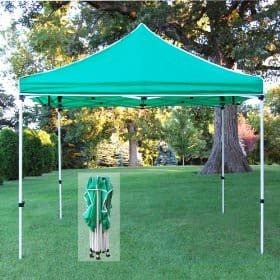 While other people are sweating in the sun or getting rained on, you’ll simple take your gazebo pop-up out of the trunk and have it open in less than a minute. These canopies are not created for just a single purpose- the uses are truly unlimited because of the intuitive design. Special joints allow the structure to fold into a compact shape for storage and transport. Once open the structure is rigid enough to stand up against wind when the proper weights are used. Weights may be necessary in wind conditions over 10 miles per hour, depending on the weight of your specific gazebo. Instead of having legs that sit perpendicular to the ground, pop up gazebos have slanted legs. 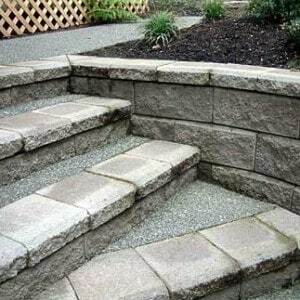 This serves two purposes, the first being that this leg orientation gives the structure strength and prevents tip-overs. The second reason is that it gives users more space to maneuver inside and put their stuff. Powder coated steel joints prevent rusting of the metal. During this process, the powdered paint is heated at high temperatures until it melts onto the bars. Units that feature adjustable legs offer even more flexibility. You may have cases where a family member or friend is taller than the rest of the group. Simply use the adjustable legs to make the structure higher. A push-button adjustment system requires the manual adjustment of each leg. Make sure to adjust each leg to the same height to ensure proper stability. When it’s time to pack up, the gazebo pop up legs must be folded back into the standard position. A structure is only as good as the materials used to make it. Pop up gazebos are strong and durable because of the steel frame. A tubular steel frame combined with synthetic joint components result in a long lasting gazebo structure. Equally important is the fabric canopy to provide shading and protection from the elements. 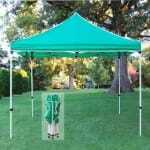 Your easy pop up gazebo will most likely be made of a weather and fade resistant polyester canopy. Polyester is the natural choice for a canopy because it can be coated with special chemical agents for added protection. Fade blockers and anti-aging chemicals can be added to the polyester to protect against harmful UV rays. 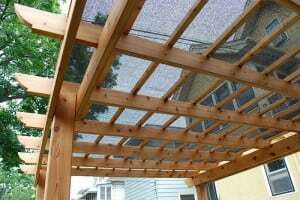 Most materials fade in the sun, but your canopy can have added resistance if you buy one with this feature. Fungus blockers are also good to have to prevent fungi from forming between the folds while wet in the folded position. 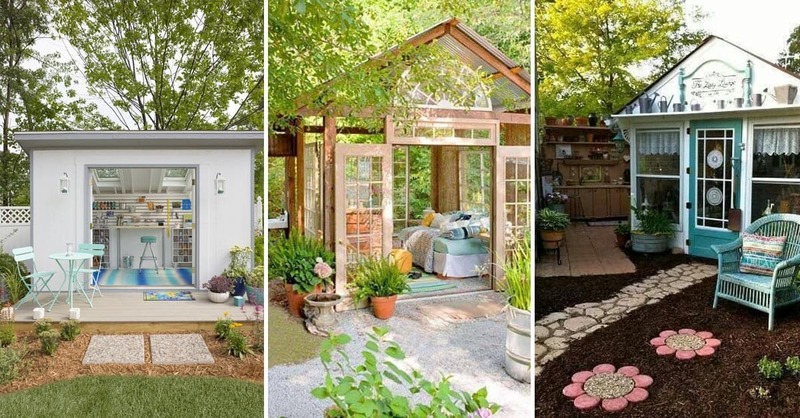 Naturally, there are many types of pop up gazebos that serve different needs. For the typical family outing, for example, a 10 x 10 gazebo can work great. Several chairs, a cooler and a portable barbecue can easily fit inside. However, for an outing like a camping trip, this structure could make you feel a little exposed. A tent pop up gazebo is the obvious solution. 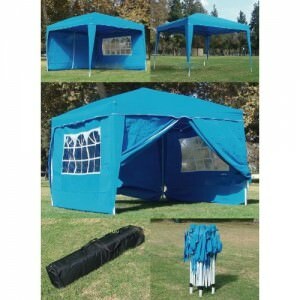 These gazebos maintain the pop-up feature but have fabric sides for protection. This has to be the fastest tent you’ll ever set up. These tent-style gazebos are not limited to camping and are used by vendors, beach-goers, and more. Clear plastic windows allows for visibility even when closed. You may already know exactly what you will use your ez pop up gazebo for, but here’s a few more ideas for you to consider. When you’re at the local park for example, you may be having a barbeque, gathering with neighbors, playing with the kids or having a picnic. Even in harsh weather conditions that would otherwise be inhospitable you can enjoy the outdoors. The canopy shade protects skin from harmful UV light that can leave painful sunburns. Having your own personal retreat on a sunny beach is the only way to go. Vendors at swap meets and local events use gazebos to define the limits of their store. There is really no better option for portable shelter. 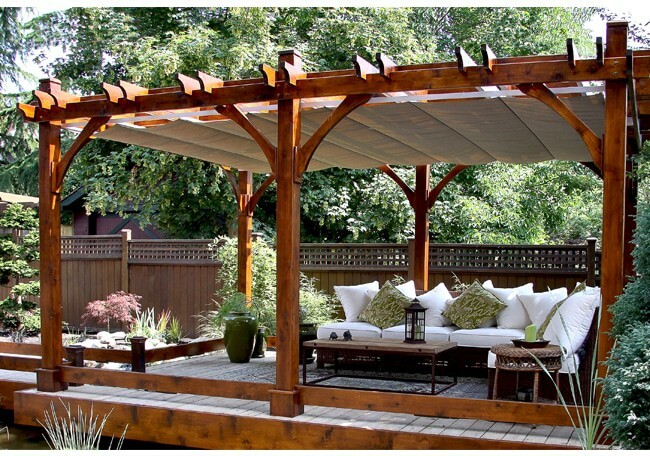 Some people even use these gazebos on their deck as a deck canopy. I loved my old popup canopy. We used it for every barbeque that we had. It was extremely useful.